Most parents love a product that makes getting out and about with the kids in tow easier. If that product is aesthetically pleasing in both looks and design, and the kids think it’s awesome fun, then it’s definitely worth a try. We mentioned the captivating pram that is the Orbit Baby G2 earlier in the year. The clever crew at Orbit know what parents and children need and continue to deliver awesome products that leave me wondering why we don’t yet have this pram here in Australia. It’s such a huge success overseas that I wonder if a nation of begging parents might give a distributor a push. The latest accessory for the G2 is the Sidekick stroller board and be warned, parents are going to love this but I think it’s the kids that are going to get a real kick out of it. 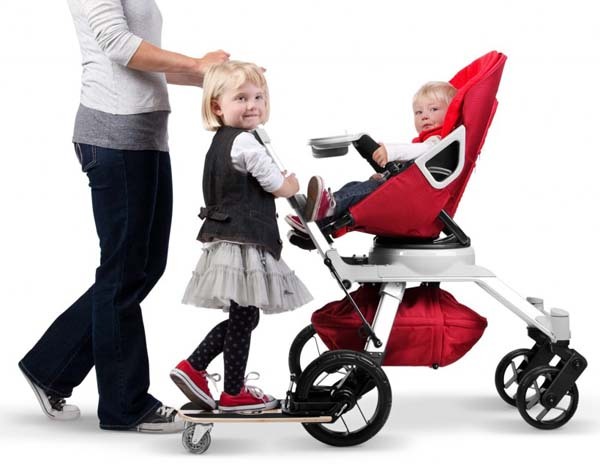 The Sidekick by Orbit is a skateboard that attaches to the pram to give a side riding position rather than the traditional rear position. This is what pram pushing dreams are made of – no more children wriggling about trying to see over their younger sibling and no more parents having to reach over their children to push the pram. Marvellous! When your toddler wants to walk, you simply flip the Sidekick up and out of the way, saving the ankles of passers-by. The Sidekick is suitable for children weighing up to twenty three kilograms (usually around four years) and includes handles that fasten to the side of the pram so your child can safely hang on. The one drawback is that the Sidekick only fits the Orbit G2 pram frame. I’m crossing my fingers a universal version will be made soon. The Sidekick is priced at US$120 from Orbit Baby. Unfortunately there is no shipping on this product to Australia. But you can visit our Chooser to find other prams with toddler options that are locally available.